Halloween is just around the corner and if you haven't picked out your costume yet, you better get to it. Costumes are going quick and some of the best places to find a costume are value Village, Goodwill, and other thrift stores. It's almost more fun to piece together a unique outfit rather than pick one of the already put together, totally expensive outfits that a lot of these party city places carry these days. If you're looking for really fun events this hollowing season. Is what's going on around Palm Desert. The Rocky Horror Picture Show – of the ultimate Halloween movie is playing Friday at 7:00 PM at the Palm Desert 10 Cinemas at the Westfield shopping mall at 72840 Highway 111. Have fun at the Ice Skating at the Haunted Castle located at Desert Ice Castle at 68600 Perez Rd. and Cathedral City. You'll have fun with spooky lights, hollowing music, and lots of candy from 7 PM to 9:15 PM Friday through Tuesday. Terror Fest 2018 is presented by Desert DJ entertainment group with four stages. Next door to the Empire Polo Club, this cool event is happening Saturday from 8 PM to 2 AM at the tack room Tavern at 81800 Avenue 51 in Indio. Prices are just $20 or $25 of the door. Beneath the Sands is happening at the Ace Hotel & Swim Club on Saturday and Sunday with jampacked activities located at 701 E. Palm Canyon Dr. in Palm Springs. There's creepy sounds from around the globe, a shop of horrors, live performances and cocktail parties. 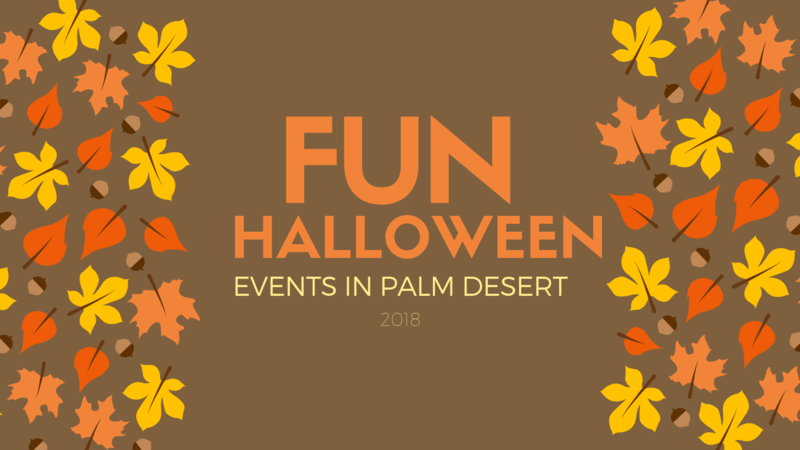 Families of all ages can enjoy the Living Deserts Howl-O-Ween Saturday, October 27 from 9 AM to noon and Wednesday, October 31 from 6 PM to 8:30 PM. There will be Halloween decorations, carnival games, pumpkin bowling, arts and crafts and more. Entry is just $10 for nonmembers and free for members. The Living Desert is located at 47900 Portola Ave. in Palm Desert. Frankenstein – located at Wellwood Murray Memorial Library in Palm Springs on October 23 from 10:30 AM to 12:30 PM you can celebrate the 200th anniversary of Mary Wollstonecraft Shelley's novel Frankenstein. Be safe out there, have fun, carve those pumpkins and get them on your doorstep and have a happy Halloween.